Well, friends, you’ve seen most of Little Crafter’s epic Teenage Mutant Ninja Turtle Party, but one thing I haven’t mentioned yet is the decorations. 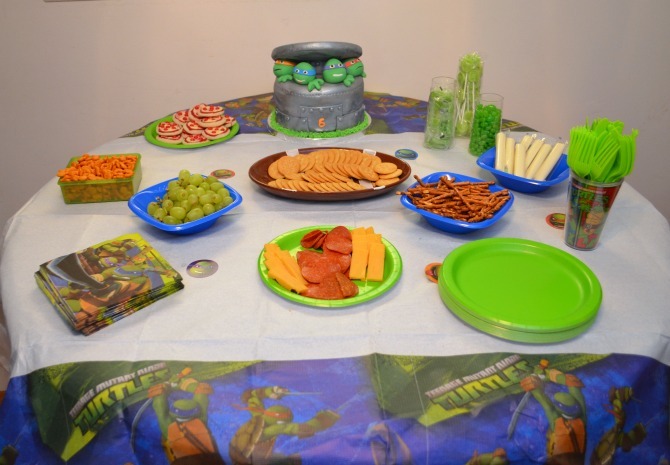 I did show you our super cool TMNT Party Lanterns, which were a huge hit, but that wasn’t all. As with any party, we needed basic supplies, like tablecloths, napkins, plates, and utensils. This year, those things were provided for us by our friends at Party Pail, which we really appreciated! Here’s a quick look at what we chose. The food table wasn’t the only one in need of a tablecloth. I also needed to cover the gift table, the “slime station,” and the tables where the kids would be crafting. We had 12 kids coming who were between 3-10, so I set up three small “tables” as work stations where they could make their Pizza Magnets and Turtle Puppets. One was the coffee table, one was a child sized table that usually lives in our basement, and the other was the piano bench. I had ordered several Fresh Lime Plastic Tablecovers, which my mom helped me cut into smaller pieces and use to cover each of the smaller tables. We taped the corners in place so they would stay put while the kids were working. There was also enough left to cover a card table to put gifts on, and our small wooden table in the entryway that held the favor bags. The last thing I ordered was a cute little Teenage Mutant Ninja Turtles Table Decorating Kit which had a fun centerpiece, four other stand up decorations, and some little round discs with the turtles’ faces on them to spread around on the various tables. I put two of the decorations with the “Cowabunga” sign on top of our bookcase. All of those things, combined with the cool signs Erin designed for each station, made up our décor for this epic TMNT adventure! What do you think? Does it make you want to party, dude? So cute! Connor loves TMNT too! !